PONTE VEDRA BEACH — As the wind stilled and the sun set and the emptied bleachers loomed in the darkness, Sunday evening’s post-tournament anticlimax began setting in at Sawgrass. Rory McIlroy was still on property, doing something that winners do somewhere in the palatial clubhouse, but his car was one of the few left in the players’ parking lot. The PGA Tour is a traveling circus, after all, and it moves on fast — even in Ponte Vedra. But I’d urge you to bask in this week’s action a little longer. Remember: it’s not always this good. Sundays aren’t automatically this fun. This Players really was better than most, and you’d be doing yourself a disservice not to revel in its glory. While all great Sundays play out differently, many of them have common ingredients. Let’s run through Sunday’s recipe, and remember why it was so delicious. Going to Sunday, this was the only guarantee. The final two pairings — Rahm and Fleetwood, Day and McIlroy — were four-for-four in compelling star power. Plus, the Players is the most stacked field in golf, which ensured there would be someone emerging from the chase pack, too. Sunday meant something to each of these players. For Rahm, it was a test of his willpower. Could the hot-headed 24-year-old hang onto the lead during a brutish final round? For Fleetwood, it was a question of resume. Could one of the game’s new elite snag his first PGA Tour win? For Day, it was a chance for a bounceback after injury and semi-controversy. And for McIlroy, it was a chance to reassert himself as the game’s top dog, to silence the closing doubters, and to potentially launch a new phase of his career. In all, a great place to start. A perfect spectating Sunday can’t be all roses, and oh boy, did our heroes hit some rough patches early. They say adversity reveals character; it reveals bogeys, too. The move to March hardly felt like a punishment on Thursday or Friday, but that changed Sunday: Temperatures in the 50s, a swirling north wind and spells of intermittent rain set us up for potential chaos — and the leaderboard’s top four played along. Rahm, Fleetwood and Day each bogeyed 1 (and more), while McIlroy doubled 4. Through four holes, all four were over par. That meant that damn near the entire field was brought back into the melee. Over the course of the day, I jotted down the names of players who shared the lead. Rahm. Fleetwood. McIlroy. Ancer. Schniederjans. Furyk. Pepperell. Vegas. Snedeker. Did I miss anyone? This was March Madness, and it was madder every minute. Sunday was pure March Madness at Sawgrass. Rory McIlroy approved. TPC Sawgrass delivered the goods on Sunday. Weather, circumstance and course setup combined for a punishing test that nonetheless rewarded precise play, yielding bogeys and doubles but plenty of birdies, too. From a viewing perspective, there’s a lot to be said for just knowing the holes, and the back nine at the Players is nearly as famous as it gets. Sure, TPC Sawgrass can feel like a multiple choice test, and it’s not my ideal of a golf course. But it’s a challenging, strategic place to navigate, with pitfalls and rewards everywhere. Even as the weather settled down, the entire back nine delivered. Ten was a brutal par-4. Eleven looked like a birdie hole, but it swung the tournament when both players in the final group found the water. Twelve was a compelling par 3.5, with some players even laying up on Sunday for some nice variety. Thirteen yielded as many birdies as bogeys and was a straightforward respite before the rollercoaster finish. Fourteen and fifteen were testing par-4s that saw the beginning of McIlroy’s win and the end of Rahm’s chances. Rory is back on top. That led into the finale: a must-birdie (or eagle!) at 16, a treacherous pin (with triumph and failure a-plenty) at 17, and then 18, which was Sunday’s toughest hole. You know these holes, you love ’em and you got to watch the lads do their work on a proper canvas. Budding fan favorite Eddie Pepperell drained one of the most electric putts I can ever remember seeing, a snaking 50-footer that went up and down and around and in at golf’s most famous green to tie for the lead. But it took all of one group — one group! — for Pepperell’s putt (and celebration) to get upstaged by Jhonattan Vegas, who made the longest putt in the hole’s history and took a well-deserved victory lap around the green, pumping up the fans. By the time both had signed their cards, a McIlroy miss made it a five-way tie for first at 14 under par with a handful of holes to go. Five guys in the lead! How often do you see that? But it was Jim Furyk who charged after his seven-iron from the 18th fairway and pumped his fist as it landed just three feet from the hole to post 15 under, leaving just one man capable of catching him. I’m not even sure what this one is, but it felt like there were a bunch of possibilities. The putts by Vegas and Pepperell were legendary. Furyk’s final seven-iron was clutch as could be. But McIlroy positively owned the final few holes. He called his six-iron from the bunker at 15 the best shot he’s hit this year. And that’s before he got to perfectly placed irons into 16, 17 and 18, where he had the gall to hit one to the water side of the flag with a one-shot lead. But in the moment, the signature shot felt like McIlroy’s macho tee ball down the 18th fairway. He let the media in on a little driver strategy after the round that he began at the 2008 Hong Kong Open, when he decided that if he made a good swing, nothing bad could happen. I’m tempted to wax poetic about McIlroy kick-starting the second phase of his golf life, his status as golf’s most thoughtful star or “the game” being that much better for his being involved. Instead, I just want to give you a complete question and answer from that press conference. His perspective speaks for itself far better than I could by proxy. Q. Obviously there’s been a lot of discussion about chances the past few months, final rounds and all that. How much had it weighed on you, or was it an annoyance? And how much of a relief is this to do it this way? 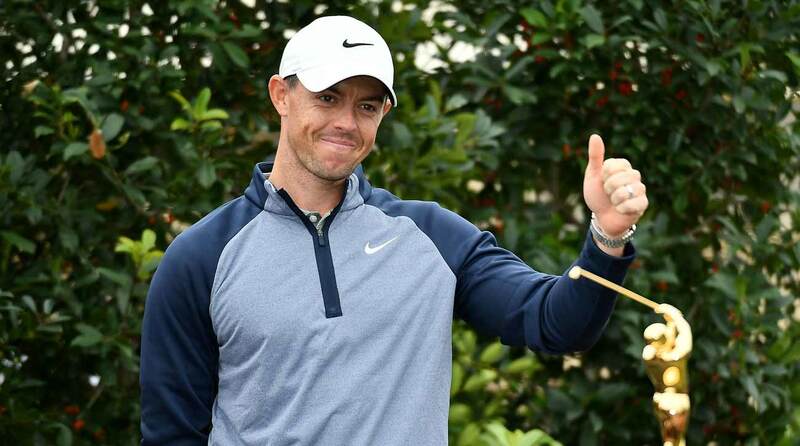 RORY MCILROY: Yeah, I guess I’ve been good. I’ve been disciplined this year in not reading a lot of stuff about myself, so that has helped because I haven’t read any of the negativity or anything that — and obviously I know that it’s going to happen because of who I am and what I’ve done in the past or whatever, but I really have left each tournament happy. Okay, Kapalua I had a chance, but Xander shoots 11-under. And Mexico, D.J. does what he does. L.A., not birdieing 17 and then bogeying the last, that was a little bit painful. But I have to — you know, when you reflect on the week, you have to reflect on the 72 holes and not just the last two holes you played, and every time I reflected on the 72 I’ve played, I’ve been pretty happy. I’ve done everything I’ve wanted to do. I looked at my stats at the end of every week. I’m leading strokes gained tee to green, I’m putting well, my around the greens is good. Everything was in a really good place, and that’s why I was just preaching patience, and it was just a matter of time. Easier said than done, obviously, but I think having that attitude let me go out there this week after the disappointment of Bay Hill on Sunday, and I said, that’s the great thing about golf, you can get straight back on the horse and you have another opportunity the very next week, and not a lot of sports or sports people have that luxury. So I just wanted to take advantage of it. I know I’m playing well. I know I’m shooting the scores and hitting the shots, it’s just a matter of doing it for 72 holes. All week, McIlroy talked about the P’s: Perspective, patience, poise. He showcased his newfound mastery of those traits in getting the W. But he avoided a massive fist-pump or outpouring of emotion like we’ve seen from him in big wins in the past. Instead, McIlroy’s win inspired emotions of a different kind: clarity, certainty, contentedness. Would that we could all speak and act with the same composure, when faced with criticism. Rory McIlroy was fantastic Sunday. TPC Sawgrass was fantastic, too. Above all, it served as a reminder why we watch: because sports provide a better, more unpredictable drama than you’d ever think to draw up. So don’t let this one slip away just yet. Kick your feet up and throw on some highlights of the 2019 Players, and the Men in the Arena plying their craft. Wrestle with Rahm’s baffling decision-making at 11. Prepare yourself for madness at 17, courtesy of misters Pepperell and Vegas. Hop aboard the Furyk Float as the Ryder Cup captain betters every player from his U.S. Team. And drink it in as Rory McIlroy, the eyes of the golf world upon him, revels in the moment down the stretch.